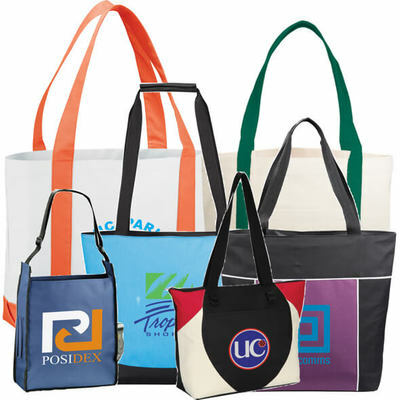 Tote Bags are one of the most popular promotional advertising tools today. They are no longer just limited to trade shows. They are also being used by companies and businesses of all sizes to expand recognizability of their brands and gain new business. One of the reasons for the popularity for promotional tote bags is their usefulness. Many products used for promotional purposes are aimed at a particular audience or specific demographic. Totes, however, can be used by anyone and everyone. Their uses are as varied as there are styles of bags available. The most common use are as grocery bags, but other retail stores are now making them available with their logos prominently displayed. More than 5,700 impressions in the US! In a 2014 study conducted by the Advertising Specialty Institute, bags were the third most popular promotional item in nine countries surveyed--including the US and Canada. That means 34% of US consumers own bags with a company logo. US women are 40% more likely to own a bag than men. The study also found that they generate more impressions in the US than any other promotional item. The green movement is an important factor in the prominence of reusable bags. More and more communities are banning the use of plastic bags at groceries and retail stores, driving up the need and desire for reusable bags. Choose from many styles, sizes, and colors! Consumers will find uses beyond just shopping, but for travel, storage, picnics and lunches, and more. A custom tote bag given out for promotional purposes will not be refused and will be noticed by many others for a long time. Please browse through our wide variety of totes available and waiting for your customizing. With all colors, all sizes, shapes and styles, we are confident you'll find one that will be perfect for your promotional needs.